Like Mindy before me, I pledged I would speed up my workflow this year using keyboard shortcuts. Web design is an interface-intensive profession: we use 3+ programs at once and navigate between dozens of folders on an average project. When designing a comp, I use over 50 distinct commands in Photoshop alone (not counting the web browsing, email, and Illustrator commands). This is is a huge amount of time spent moving the mouse, which could be easily reduced by a couple shortcuts. The trouble with shortcuts? There's just too many of them. It's hard to find a place to start tackling a list of key commands, and once you begin learning, it's harder still to commit those shortcuts to memory. 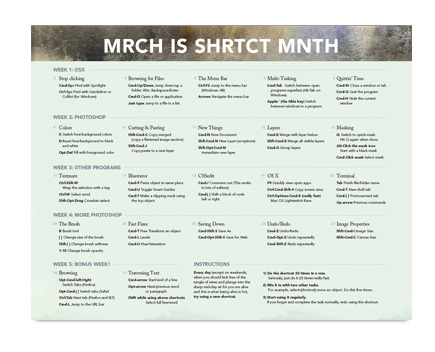 But together we shall overcome: Download the printable Viget shortcut calendar for March, and learn (really, truly learn) a new shortcut every day. Programs covered: Photoshop, OS X/Windows, Illustrator, Textmate, CSSedit, and the shell. Every day, try to learn at least one shortcut from the day's list using the exercises shown. If you already know a day's shortcut when it comes up, don't just skip that day! Think about a common task that you use the mouse for, find the shortcut for it using Google, and complete the same exercises with it. Do the shortcut 20 times in a row. Seriously, just do it 20 times really fast. Mix it in with two other tasks. For example, select-[shortcut]-move an object. Do this five times. Start using it regularly. If you forget and complete the task normally, undo and use the shortcut. 2nd - Stop clicking on folders and apps! Cmd-Spc - Find and launch files and applications with Spotlight. Ctrl-Spc - Even better, do it with Quicksilver, or for Windows, Colibri. Once you get fast with the keyboard, browsing the menu bar this way will be as easy as using the mouse. Ctrl-F2 - Jump you to the menu in OSX, and Alt will in Windows. Cmd-arrow - Jump to the beginning/end of a line/text area.